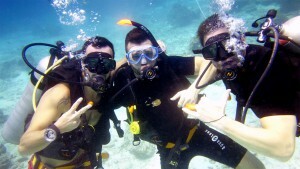 Scuba Diving aboard the M/V Scuba Explorer, Phuket Thailand's best luxury liveaboard! Sometimes people ask if we get tired diving five times a day, or bored of scuba diving in the Similans, our answer is always the same. Hell no! You will not find a bigger or more spacious diving deck on a Thailand liveaboard vessel than you will onboard the Scuba Explorer. The Explorer is a luxury liveaboard with a maximum guest capacity of 20, yet, we have over 40 tank spaces, so if you do the math there is a lot of extra space. You won't experience overcrowding or elbow banging fights to get into your equipment, we want you to be calm and relaxed when diving with us and enough space to move is a big part of the package we offer. On the dive deck we also have fresh water buckets for cameras and computers, fin racks, a table for equipment, weights & and weight belts, mask defogger and detergent, fresh water hoses for rinsing, two marine toilets and did we mention huge amounts of room to get geared up in. The deck is covered in soft non slip matting and the ready platform is nice and low to the water line making for easy entries into the water for your dives. Diving equipment is not included in the price of the liveaboard trip and when making a booking your equipment sizes will be taken and we will ask exactly what equipment you require for the trip. When you arrive your gear will already be set up on a tank with your name on it, all you need to do is make a quick check that you have everything you paid for and check your equipment is working. If you are bringing your own equipment, we will put your name on a tank and let you do your own setting up. Our instructors and staff take great pride in making sure your equipment is in perfect working condition when you arrive and looked after while onboard. Each diver is also given a surface marker bouy for making safe ascents, but it is unlikley you will ever need to use it as your instructor will be looking after that part of your dives, so stick close to them. Specialised personal equipment like cameras, computers, strobes and torches are the responsibility of the guest. Our staff will always take the utmost care when handling any personal equipment, for example, passing camera rigs to you after entering the water, but the Scuba Explorer, staff and crew, take no responsibility for lost and or damaged gear including flooded equipment, it is your responsibility to ensure correct maintenance of personal gear and safe diving practices. All of our scuba diving tanks are standard Aluminium and filled to 200 bar (3000 psi) for each dive. Tanks are re-filled between dives, you will not have to shift equipment from one tank to another, again we like to keep things very simple for our guests. Larger Steel tanks are also available for those of you that like to breathe a lot while diving. Please mention this when making your booking and our staff while be more than happy to help. Nitrox fills are available but you need to specify that you wish to dive using nitrox while making your booking so we can bring the appropriate equipment necessary for re-filling your tanks with nitrox gas mixes. We can accommodate for technical diving and other gas blends while onboard, but please let us know during the booking phase about your requirements. On almost all dives we enter the water from the Scuba Explorer ready platform via giant strides. The Scuba Explorer will pick you up at the end of your dive, getting back onboard is as easy as passing your fins up to the boat boys and climbing up the ladders. Sometimes though depending on the location we do use the dinghies for entry and pickup. When using the dinghies it is a simple backwards roll off the side and into the water, when getting back on pass your weight belt up, then your bcd, then launch yourself into the dingy, it is always the most entertaining part of the day. Your instructors while onboard and in the water are there to help you, 'the only silly question is a question not asked'. Please feel free to ask them about the dive sites or to let them know about issues with equipment, they will always be available to help you. While diving your instructors will be keeping a close eye on you but also looking for Whale Sharks and Mantas, so please stay close to your instructor while diving, that way you will surely see more of the spectacular ocean life that exists on our favourite dive sites. Dive briifings are conducted 10 - 15 minutes before every dive, they detail the dive sites, conditions, special features and marine animals you can expect to bump into while diving. They are very informative and not to be missed. Night diving is an optional extra each night you are onboard. Our instructors are always willing to take you on night dives so don't hesitate to ask them about doing your fifth dive of the day. Torches are of course provided for our night divers. 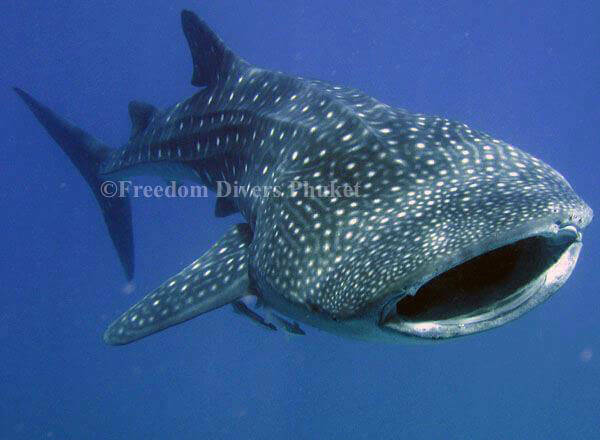 Imagine seeing a Whale Shark on your PADI Advanced Open Water Navigation dive? Or getting to identify a White Tip Reef Shark on your Fish Identification dive? If you are thinking of going from PADI Open Water diver to Advanced diver why not complete the course on one of Phuket’s finest luxury liveaboard cruises to the Similans & Surin Islands or South Andaman. This is a fantastic opportunity to not only dive some of the most beautiful dive sites in the world, but also to take your diving to the next level. Spend 3 or 4 days on board diving 4 or 5 times a day and relaxing in between dives in the crystal clear turquoise waters of the Andaman Ocean. You do 5 dives to complete the Advanced Open Water course, Deep and Navigation are mandatory; you choose the other 3 from a choice of 15 exciting dives. With 8, 10 or 12 dives in the cruise packages there is plenty of time to complete the course over the few days; your Instructor will choose the best site to complete each AOW dive to get the most enjoyment out of it. There is a bit of reading and a couple knowledge reviews to complete, this gives you a better understanding of all aspects of diving from decompression, to understanding nitrogen narcosis, learning how to identify marine life by shape, colour and habitat, understanding the oceans currents, and learning how to navigate by means of compass and natural features. This not only increases your knowledge and understanding of the marine environment, it will also enhance your diving skills and enjoyment. There are 15 dives to choose from. Choose the Fish Identification or Underwater Naturalist dive and you will be spoilt by choice on the marine life, you will learn so much about the different creatures and habitats under the ocean. 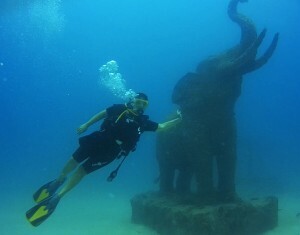 Practice your buoyancy on Elephant Head Rock with the Peak Performance Buoyancy dive, the swim throughs on this dive will surly perfect your buoyancy as you swim close to the sand careful not to disturb it or hit your head on the overhead rock, some swim throughs are tighter then others, you will certainly be a better diver by the end of it. Where better to do the Deep dive then the magnificent Koh Bon, dropping to depths of 30m, where you may be lucky enough to be surrounded by Manta Rays. Take the Night dive on Richelieu Rock and experience the peace and serenity of the ocean at night, encounter all the wonderful critters that come out at night, Shrimps, Octopus, the Moray Eels hunting. Learn the Drift dive on Koh Tachai where the often strong currents give the perfect conditions for this exciting type of diving. Take your advanced course on board the Scuba Explorer on a trip to the Similans or South Andaman and get 60% off the normal AOW course price; this is an amazing offer too good to miss. Whether you choose the standard, deluxe or suite cabin option you will only be paying an extra 6000 THB to complete your Advanced Open Water while diving at some of the world’s top dive sites. There are so many options to choose from on the advanced open water course, and to get to take this course in the Similans means that not only will every dive completely different and equally as exciting, you will also get to see marine life you will never have encountered with visibility ranging from 20m-40m on many of the dive sites. The dive sites in the Similans are so diverse, with so much marine life; it will be like nothing else you have experienced, an unforgettable lifetime opportunity! This entry was posted in Onboard PADI courses and tagged diving on August 2, 2015 by Nina Morris. Richelieu Rock is often the very reason divers want to go on a Liveaboard to the Similans & Surin Islands, it is the dive site people most want to visit and the reason is justified. The dive site itself is breathtakingly beautiful, covered in purple soft corals, Anemones, Gorgonian Fans, Knotted fans, Sea Whips and full of life, it is easy to see why divers want to come back again and again. No two dives are the same, and it is impossible to see everything in just 1 dive, for that reason the Scuba Explorer spends a whole day at Richelieu Rock making 3/4 dives. We have had the added pleasure of doing a night dive on Richelieu Rock, very few Liveaboards offer this due to currents, depth, customer experience or time. So of course we all jumped at the chance, kitted up and jumped in before the tour leader could change his mind. The excitement of descending onto Richelieu Rock in the dark was apparent in all us Instructors, I don’t think the customers realised that a night dive here was not often done as they laughed at us all fighting to get in the water first. As we all descended with our torches turned on the colour of the corals light up under the artificial light, glowing in the beam it looks even more beautiful at night. The peacefulness of the Ocean at night and the fact that we were the only Liveaboard diving there made me feel utter calmness, like I was floating through space. I love night diving and this dive was definitely one to remember. 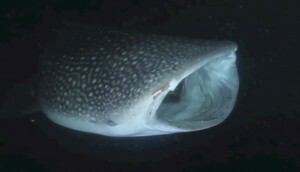 This entry was posted in Dive sites, Marine wildlife & encounters, Stories from the dives and tagged diving, wildlife on October 7, 2014 by Nina Morris. Freedom Divers asked me to come on-board the Liveaboard trip to the South Andaman for 2 days/3 nights to teach an Advanced Open Water course, of course I was delighted to accept, even the storm warnings were not enough to put me off. I met my student to go over a few skills in the pool before we set sail that evening, after a few hours in the pool with her I was quietly confident that she would have no problems with the dives we had coming up. I also learnt that she was very excited and had never spent a night on a boat before, this was to be an experience for her. We boarded the boat at 8pm ready to leave for Koh Phi Phi early morning for our first dive at 7am. The first dive I decided was to be a fun dive as my student had not dived in a year I thought it better to ease her into it and not throw her in the deep end with skills and knowledge, this turned out to be a good idea as there was limited visibility and fairly strong current on the first dive, it was still enjoyable and gave my student time to get used to diving again. Swimming through schools of Big Eyed Snapper my student gave my the thumbs up (wrong sign but I knew what she meant) to say she loved it, mental note here to recap some of the underwater hand signals. The following dives I got the correct signal of ‘awesome’ a lot. This entry was posted in Stories from the trips and tagged diving on July 18, 2014 by Nina Morris.